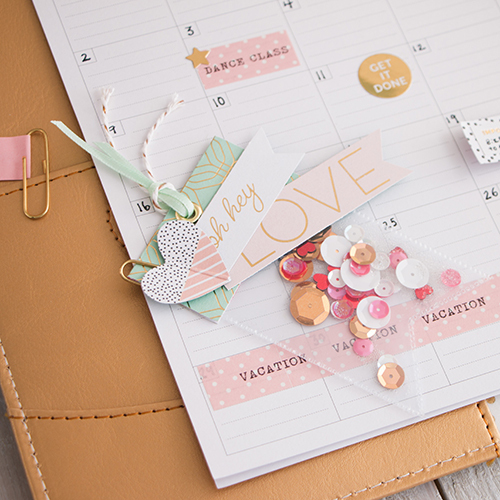 Style your planner with this fabulous project! Choose a pendant, heart, star, or other basic shape for the clear pocket. Lay the plastic sheet protector over the desired shape. Seal all but one edge of the plastic sheet protector into the chosen shape using a hot fusing tool and a metal ruler guide, a sewing machine, or double stick tape. Fill clear pocket with sequins, confetti, and/or micro beads. Seal the final edge closed. Cut the sealed pocket from the unused portion of the sheet protector. Cut a sentiment and some embellishments, like a heart, from the Simple Joy Stack. Adhere to the tag. Punch a hole in the top of the tag. Add a grommet. Adhere a paper clip to the back of the finished shaker tag.